This is an important case for anyone playing tricks with multiple patents and lots of priority claims. In the decision, the court held that an ex post cancellation of priority claims in a parent application interrupted the previously claimed chain of priority in the child application — rendering that child invalid based upon the inventor’s own prior issued patents. Natural Alternatives v. Iancu (Fed. Cir. 2018), is one of those increasingly rare inter partes reexamination decisions. The timeline of this case serves as a helpful reminder of why this avenue of patent challenged was cancelled by the AIA. In particular, this case is following a quite typical inter partes reexamination pathway — receiving an appellate court decision six years after the reexam’s initial filing. that is not part of a dipeptide, polypeptide or oligopeptide. The problem for the patentee here an unforced error in its chain of priority. The patent at issue (applied for in 2011) is the last in a chain of eight U.S. patent applications plus one provisional and an original UK application originally filed in 1996. The new applications were filed in series just before the prior application’s issuance — such that the whole chain of priority needed to remain intact in order for the 1996 date to be effective. The fifth and sixth in the series followed this approach and were filed with proper claims of priority reaching back all the way to the 1996 UK filing. However, just before the fifth-application issued, “Natural amended the fifth application to delete its claim of benefit from the fourth through first applications in the series back to the 1996 British application’s filing date and, instead, claimed benefit solely of a provisional application filed in 2003.” The idea here was that the fifth would have a later effective filing date and thus a later expiration date. The problem, though, is that the changed priority claim in the fifth application broke the chain of priority for the sixth, seventh, and eighth. Natural can only win on appeal if this Court accepts its erroneous thesis that a benefit claim vests on the day an application is filed and, thereafter, cannot be divested by events in another application. Natural’s thesis has no support in section 120 or this Court’s precedent. Natural chose to delete the benefit claim in its fifth U.S. application and thereby obtained a longer term for the patent issuing therefrom. The foreseeable – and easily avoidable – consequence of this voluntary action is that Natural’s sixth through eighth U.S. applications would no longer be entitled to benefit of the filing date of its fourth through first U.S. applications. The court notes that this problem was “easily avoidable.” Natural could have, for example, filed a separate continuation application from the fifth application to get those claims without soiling the trunk of priority claims. Without the priority claim, Natural’s own prior patents become on-point prior art — as such, the invalidity is affirmed. “receiving an appellate court decision six years after the reexam’s initial filing'” – is this timeline fast or slow? As European patent attorney, I would say it is rather fast (if it were the EPO) but I guess you consider it too slow? Thanks Peter for this perspective. Thanks, but you keep me guessing if it is indeed slow in your view? LOL – Yes – I do think that 6 years is slow — especially in the common case-within-a-case situation (pending litigation awaiting the outcome of the PTO determination). Real question: Is it too late for Nat-Alt to correct the correction for patents six, seven, and eight? I would think that it has to be too late. They needed to be co-pending on #4 when they filed #6 in order to make up for the fact that their amendment in #5 broke the chain. They could correct the mess if they were still co-pending with #4, but that ship has long since sailed by now. According to the chart that Prof. Crouch assembled above, #6 was filed in 2008, while #4 issued in 2004, so there just was never the co-pending overlap that they would have needed to avoid the problem here. Are there circumstances under which “the math” could work out for a patentee who engages in this tactic? i.e., could this represent an “efficient” way to maintain a “patent-protected” market position? In other words, rather than let the patent expire, play some games with the priority claim instead and pound the table with a “novel legal theory” that allows the patent to “live” (on fumes, perhaps, but still alive). Sure, it’ll cost some money to fight things out at the PTO and, subsequently, on appeal. But in the meantime the least savvy competitors may be warded off or they may even take a license. No sanctions here. But what if Natural Alternatives has been sending threatening letters regarding the ‘381 patent based on their bizarre “vested priority right” theory? Or marking their products as patented? This strategy would then seem like an “efficient” way to profit from an invalid patent. I ask the question, in part, because of the pervasive (and strange, and incorrect) belief in certain quarters that the “efficient” behavior of marketplace players is limited to “infringers”. Wow, that was a lot of straw. Frankly, I did not see any “animus” here, and was actually thinking that the oft-used (but seldom applicable) “Malcolm-malpractice” quip would be (could be) on point here. So you think the people who prosecuted this case didn’t know that if you have an application that claims priority to a chain of applications filed over an eight year period that you can’t delete the benefit claim to those applications without at least some of those applications becoming prior art? Well, that’s interesting. I suppose any belief is possible if you stick your head in the sand deeply enough. I’ve never tried to go that deep! These guys might be the Jacques Cousteaus of the field. I expect that it was an error — the priority was removed for the fifth patent — that one was a CIP that included enough new matter to stand on its own as inventive over the prior four. The problem came with patent numbers six, seven, and eight. Those three reverted back to the original subject matter but the break-in-the-chain meant that they could no longer claim priority. Sounds like maybe when they originally filed #5, they thought they were done pursuing the invention from #1-#4. Later, they changed their mind and wanted to file more applications directed to the earlier-disclosed invention, but #5 was the only application left pending by that point. Except that they amended the priority claim in the 5th app just a few days *after* they filed the sixth app. So they realized the mistake rather quickly? I’d have to look at the dates as to whether or not they still had freedom to maneuver or if they waited till the last day they could to file #5. Most likely what happened. And then the lawyers are trying to make up for this lack of foresight down the road best they can. But you really gotta look for those things down the road ahead of time. It seemed way more plausible that an “oops” occurred in the serial filings (not remembering that the chain had been broken from 4 to 5, later on when (perhaps someone else) was following SOP when filing 7 from 6 or 8 from 7 then your asserted “let’s be devious” path. Perhaps if you had any reason whatsoever why deviousness would even be “necessary” (which you have not supplied). 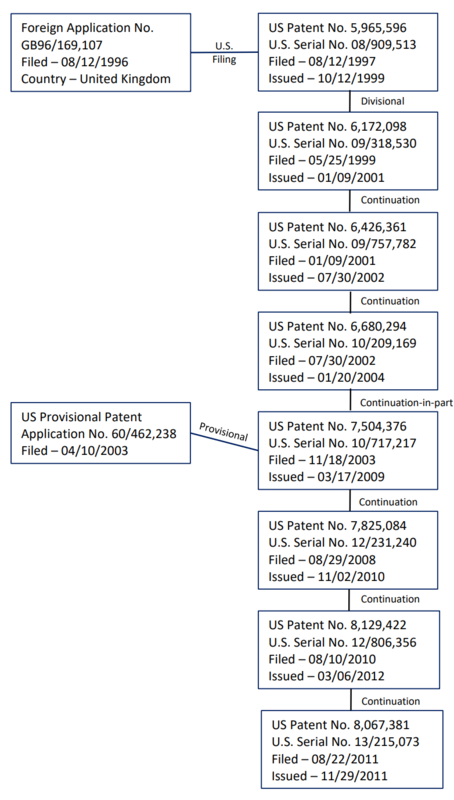 There was no memory lapse “oops.” The patentee admitted that they broke the priority chain for the 5th so they could have added term for that patent, and then they proceeded on with the 6th, 7th and 8th as if the priority chain was unbroken. They believed that they could have their cake and eat it, too. Or at least they believed that if worse came to worst, they could fight about it in court. Which they did. Note again: when it was pointed out to them that, no, you can’t do this (nobody wondered why other applicants weren’t doing this regularly? really? ), they didn’t say “Oops, we’re busted.” They said “Oh yeah? Let’s fight about it.” Heck, we don’t even know if they’re done fighting yet. Maybe they’re working on a cert petition now. The reason for doing what they did was admitted (and also obvious): they wanted more term for one of their patents, and they wanted the earlier priority date for the other patents. The real “oops” here is that they failed to file a continuation off the 4th application before they killed the chain of priority back to that application. That’s true but the question is whether that was done on purpose, or is it really an oops. Malcolm sees applicant “schemings” for NOT preserving a live link – but does not explain why such a choice would ever be made. His animus is on display. For someone who supposedly works to obtain patent protection for real clients, his disdain “does that leaky thing” at every turn. I presume he thinks they just wanted to save a few to tenish thousand k in fees. Any other reason would be dmb. Any “deviousness” is besides my point which is that the patentee’s strategy was efficient (for them) in the sense that — for a time anyway — they enjoyed a patent with an apparently longer pendency and they were able to obtain additional patents before the error was identified by the accused infringer. You struggle mightily to imbue some deviousness when clearly that simply is not as likely as plain negligence or miscommunication. Sure, they wanted to “get fancy” with the transition to “5” from “4,” but all else simply lacks any animus that you want to see. You really do have an anti-patent (and anti-patentee) mindset, and should do something about that cognitive dissonance.